Cambodia is a constitutional monarchy located between Thailand, Laos and Vietnam with Phnom Penh as its capital. The national language in Cambodia is Khmer and as a former French colony many older people can speak French as well. English is now considered more valuable by young people and many will approach you just to talk to practice their English. The culture in Cambodia is influenced by Buddha Theravada religion and its horrific history of the American bombings in the Vietnam war and the civil war and Khmer Rouge regime afterwards. These scars are still part of the national psyche. Most tourist go to the temples of Angkor near Siem Reap, a sprawling complex of temples of which the Angkor Wat is the most famous and the largest Buddhist temple in the world. Along its outside wall are beautiful reliefs telling the history of Hindu mythology. At the Silver Pagoda, or also known as Wat Ubosoth Ratanaram, near the Royal Palace in Phnom Penh is a Buddha statue made of gold and decorated with 9,584 25-carat diamonds. To get an idea of the horrors the Cambodian people experienced you can visit the Killing Fields outside Phnom Penh or the Tuol Sleng Genocide Museum. Tuol Sleng is a former high school in Phnom Penh known as Security Prison 21 and was used to torture and execute thousands of prisoners. It is depressing and not for the faintly hearted though but it is a must-see if you are interested in the country, its history and its people. The KrÃ¢vanh Mountains, also know as the Cardamom Mountains is a mountain range in the south west of Cambodia with dense tropical forest, ideal for hiking. There are several conservation areas, the Phnom Samkos Wildlife Sanctuary and Phnom Aural Sanctuary where many waterfalls and hundreds of rare flora and fauna are protected. 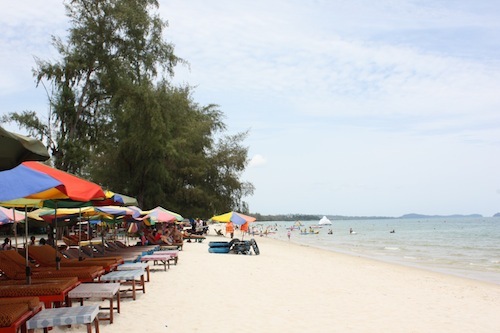 In Sihanoukville are some pretty nice beaches while for souvenir shopping best places are the markets Ta Phrom and Preah Khan in Phnom Penh. As is common in Asia, rice is the staple food in Cambodia and rice is used in pretty much every Cambodian dish. A typical Cambodian dish is Amok, steamed fish mixed with Kroeung condiment and coconut milk and covered with banana leaves. Also try the Lok Lak, made of minced beef and usually served with fresh vegetables like cucumber and lettuce. Need place to stay in Cambodia? 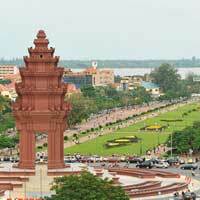 Look for more Cheap Flights to Cambodia.